Despite the unstable economic situation and a reduction in hotel revenues, international hotel chains will double their presence in Russia in the next few years, professional services firm Ernst & Young estimates, with the number of rooms belonging to foreign companies set to rise to 61,000 by 2020. However, only 50,000 rooms are estimated to be required to host the 2018 FIFA World Cup. 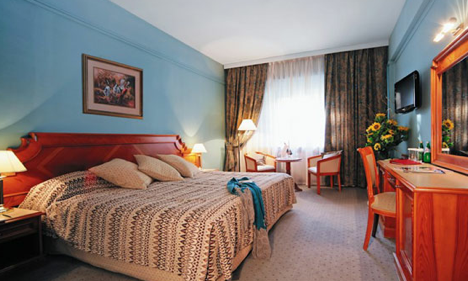 Only a fifth of the new international hotels (amounting to 6,000 rooms) will be built in Moscow. If the hotel companies are able to realize their plans, they will expand their presence to a total of 55 Russian cities. "Development in the Russian regions has always been a part of the international brands' strategy, but it was also dependent on the given market situation," says David Jenkins, Executive Vice President, Russia & CIS at JLL Hotels & Hospitality Group. According to Ernst & Young, this geographical expansion is due to a range of large high-profile international events that have already taken place in Russia, such as the 2013 Universiade (in Kazan), the 2014 Winter Olympics and this year’s Formula One Grand Prix (in Sochi), as well as the upcoming World Cup. According to Marina Smirnova, director of the hotel business and tourism department of international real estate services firm Cushman & Wakefield, a city hosting group-stage games during the World Cup will have to offer 7,760 hotel rooms in categories ranging from two-star to five-star. Moscow, which will host the World Cup final, must be able to provide 29,780 rooms and St. Petersburg, which will host the semi-final, must have 14,410. "Moscow has this number of rooms in quality hotels and they will more or less correspond to the required distance from Luzhniki, the tournament’s main stadium, if traffic is regulated in a proper way," says Smirnova. However, she adds that there may not be enough two-star hotels in Moscow, as well as in St. Petersburg. According to Darren Blanchard, senior director for business development at Carlson Rezidor, large-scale global events represent a golden opportunity for developers and the tourist industry. "Events like the Winter Olympics in Sochi and the 2018 World Cup are catalysts for hotel development," says. "The outlook is to further develop the tourist market in the long-term future." However, if Russia is to strictly abide by FIFA requirements, it will have to construct one five-star hotel, 300-400 rooms in the four- to five-star category hotels and 300-400 rooms in the three-star category hotels in each of the regional cities, says Smirnova. According to her, the total cost of building all the hotels will reach more than $1 billion. Currently, construction is underway in Moscow, while Kaliningrad (808 miles west of Moscow) and Samara (652 miles southeast of the capital) have begun looking for investors. "As our Sochi Olympics experience showed, we are able to build and equip a foreign-owned 500-room hotel in one year, something that practically no one had ever done," says Smirnova, who says the real intrigue in the preparation for the World Cup will take place in 2016-2017. "I hope that there will be significantly fewer rooms than FIFA requires, because the onetime appearance on the market of such a number of rooms will lead to overstocking," Smirnova notes. According to David Jenkins, Moscow does not need additional hotels especially for the World Cup: The city already has enough accommodation for such an event. "Thanks to the pre-Olympics large-scale construction, Sochi will not have any problems with the number of rooms; in fact, it will probably experience a surplus," says Jenkins. However, Volgograd (603 miles south of Moscow) and Rostov-on-Don (665 miles from Moscow) are planning to build a large number of new hotels. In the upcoming years each of the two cities will construct five internationally operated hotels. "In general, there is a big risk in building new hotels especially for the World Cup, which will last between four and six weeks," Jenkins warns. In particular, he says that after the short-term growth in revenue accumulated during the championship, hoteliers will be facing the problem of how to continue earning. Therefore, the aim of each city should be not to construct too many new hotels. "For example, Kiev, which hosted the 2012 European Championship, showed that after the large-scale construction of new hotels the market in the Ukrainian capital became very competitive," Jenkins adds.